5. Passed American military ANSI/BHMA A156 UL test, last more than 800,000 circles. Interface with most of the PMS systems, Fidelio/Opera registered! CE& FCC Certified! Brushed stainless steel color lasts more than 10 years. Mifare 1K card, compatible with Mifare Energy Saver. Lost guest card suspension simply by issuing a new guest card with suspending function. Lock operation recond printable: 240 pcs or more . Power"4pcs#5AA Alkaline batteries. 18 months' duration. Low battery voltage warning. (Lower than 3.5V). Self Error detecting by LED and "beep". Can be integrated with 16 public areas such as Lift/Parking/Swimming Pool/Sauna Room/Tennis court/Gym... etc. 1. 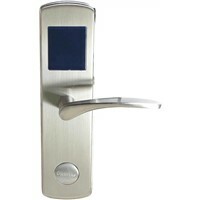 Standalone electronic keycard lock with RFID technology. 2. 304 stainless steel material, lock surface color lasts more than 10 years. 3. 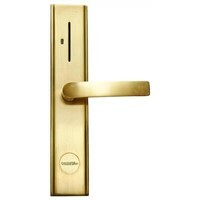 ANSI standard mortise, 5 latches, inside handle retracts latches and deadbolt. 4. 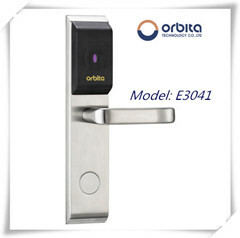 Mifare 1 technology, compatible with Orbita energy saving switch. 5. Low power consumption, using 4pcs AA alkaline batteries, 12-18 months duration depends on quality. 6. 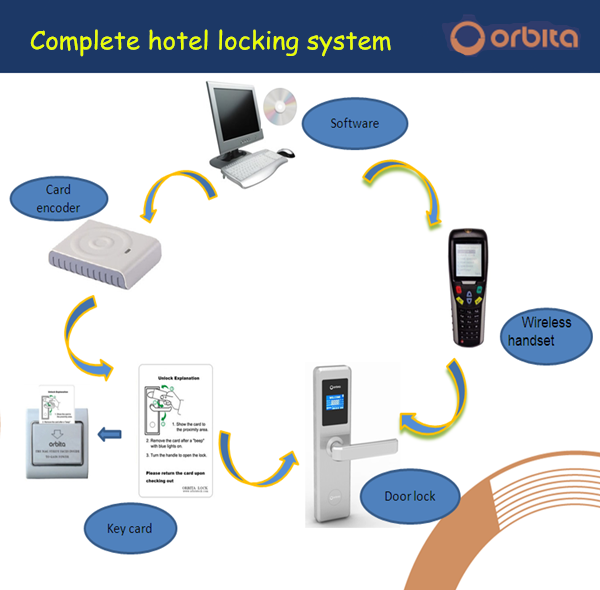 Work with Orbita Locking System that interface with Opera Fidelio and most of the PMS systems. 7. Step by step installation software, easy operation, customized language. 8. 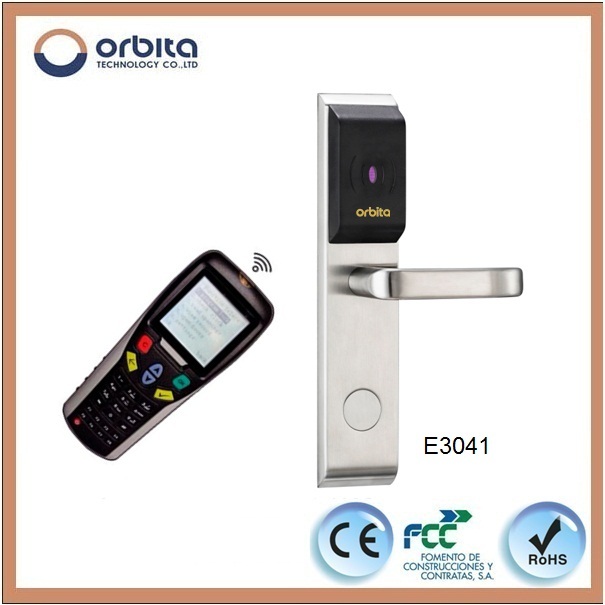 Guest Card, Master Card, Floor Card, Emergency Card, satisfy hotel requirements for electric lock. 9. Meeting room function: set up all locks as meeting room when hotel is under construction or decoration to avoid lock demage. 10. Save and print 240pcs lock opening records. 11. Issuing new card with suspending function if lost guest card or staff card. 12. Integrates with handset which is helpful assistance for lock set up and maintenance, can work as Master Card. 13. Warning by 3 times beep and 3 times red light flash indicates low battery, and still can use around 100 times. 14. Gold color by PVD technology that can resist corrosion for long time. 15. Passed American military ANSI/BHMA A156 UL test, last more than 800,000 circles. 16. Waterproof function that has good performance under hyperthermia and humid environment, popular using in Southeast Asia. 17. Override mechanical key for emergency use, individual or master cylinder. 18. High sensitivity of proximity, response in second with 3cm distance. 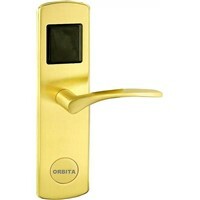 Orbita comapny was founded in 2004, manufacturing innovative hospitality products to overseas market. 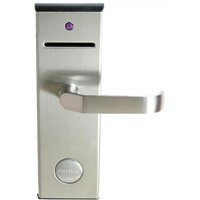 Till now, more than 5000 hotels ranging from 3 to 5 star covering 100 countries and most of the hotel chains are using Orbita hotel card locks, safes, minibars and other guest room accessories. 46,000 square meters garden factory with complete facility and 100,000 units monthly production capacity makes Orbita the biggest productivity in the industry in China. We produce more than 100 models and provide OEM or ODM services. Varies tests have been conducted to ensure the quality of the products, Orbita locking system integrated with Fedelio/Opera PMS and has wide range of compatibility, and our products are CE, FCC, RoHS, SONCAP, SASO and ANSI/BHMA A156 UL certified. Orbita owned high reputation in hospitality industry from offering high quality products, reasonable price with professional and effective service. We keep moving to bring more benefits and satisfaction to our worldwide customers. More than 5,000 hotels covering most of the international hotel chains in 100 countries. And, lots hotel projects that done by our distributors world-wide. Q: Can your locking system connect to PMS system? A: Yes. 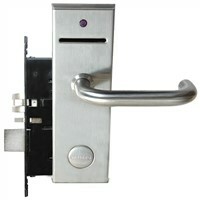 Our locking system interfaces with Opera Fidelio and most of PMS systems. Q: What is the minimum thickness of the door? A: Thickness range is from 32mm to 80mm. If door thickness is less than 32mm, we suggest to use our Euro standard . Q: How do I know whether the battery expires? A: Warning by 3 times beep and 3 times red light flash indicates low battery, and still can use around 100 times. Q: How do you pack goods? Is it safe for freight? A: We pack goods by foam case and carton, 6units/ carton. It's safe, no damage on the way.